Autumn spells adventure in so many ways – with lively celebrations, quiet moments, and a blaze of glorious color framing every byway. This breathtaking season of warm days and crisp evenings invites great escapes to Northern Indiana – so close and accessible, yet worlds away from the everyday humdrum. Festivals celebrate the season, bike trails and color drives beckon, and shopping abounds in refurbished barns and friendly villages. From the cheering crowds at a Notre Dame football game to the delighted squeals of kids and grownups riding a vintage ghost train, everyone’s experiencing fall in amazing ways. So slip away to Indiana’s Cool North in the most glorious of seasons. With so many options, you can fill a weekend or more. 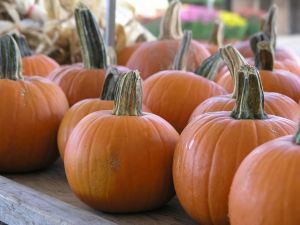 Rides to the pumpkin patch, simmering apple butter, and good old-fashioned fall family fun take center stage at this annual festival held each weekend from mid-September through October at the Amish Acres Farm and Heritage Resort in Nappanee. 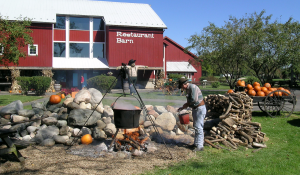 Visitors return year after year to enjoy activities that include pumpkin bowling, marshmallow roasting and watching apple cider being made at the Kuhns Cider Grist Mill. The Amish Acres shops sell fall treats such as caramel apples and pumpkin fudge. In addition, the historic Round Barn Theatre located on the grounds will be featuring the new musical Happy Days live on stage from Sept. 5 – Oct. 14. Anyone fascinated with Amish crafts and culture will love this annual Shipshewana Fall Crafters Fair festival Oct. 4-6 that pays tribute to the crafting and time-honored traditions of Shipshewana and the surrounding countryside. 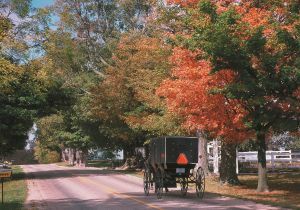 The community, where the horse-drawn buggies of the Amish are a familiar sight, is located in a region that’s home to the nation’s second largest Amish population. At the fall fair, you can browse and buy the fine creations of quilters, woodcarvers, painters and other artisans, and watch demonstrations of skills such as chainsaw carving. A host of entertainment includes cloggers and musicians, and rides for kids in miniature buggies pulled by miniature horses. 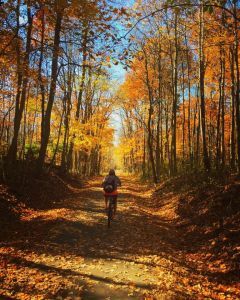 Indiana’s Cool North presents myriad opportunities for cyclists of all skill levels looking for all kinds of adventures, whether you seek an easy-going pedal on paved pathways or more extreme mountain biking. The best news is that at least part of your ride will take place under a canopy of trees blazing in crimson, gold, and orange. One of the most popular fall trails in the region is the Pumpkinvine Nature Trail, traveling from Shipshewana to Goshen through Amish countryside, where you’re likely to see the fall harvest underway. Mountain bikers love the twists and turns of the Winona Lake Trail in the town of Winona Lake. Beginning in the community of Plymouth, four trails ranging from 16 to 63 miles, take you through scenic fall countryside in Marshall County. Indiana’s Cool North values its heritage, and a great way to combine history with autumn’s color show can be found on two unique drives. A varied world of bustling communities and quiet towns await visitors to Elkhart County, and you can discover them on a self-guided Heritage Trail tour. The Elkhart County CVB will provide you with a free audio CD that narrates a 90-mile route, detailing must-see stops and giving you interesting, historical tidbits Don’t miss the Bonneyville Mill in Bristol, a grist mill in operation for more than 150 years. On the Marshall County Barn Quilt Trail, you’ll see huge, vibrant quilt patterns gracing area barns, public buildings and homes. The LaPorte County Barn Shop Hop is back for another autumn tour Oct. 5-7, taking shoppers through the colorful countryside to five special shops, some in refurbished barns. 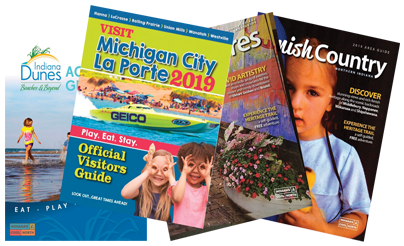 Pick up a tour map at any of these unique little stores where you can find antiques, folk art, handcrafts, salvage, re-purposed, vintage, primitives, furniture, yard art, one-of-a-kinds and more. Included on the list are the following shops: Fawn Run Farm Mercantile, Plain and Fancy, Freckle Farm Primitives and Antiques, Barn Style, and It’s All About the Barn. Even if you can’t go to the hop, they’re fun stops anytime. 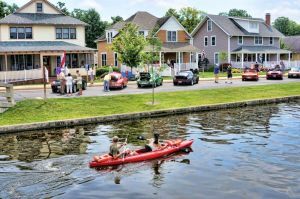 Several years ago, some residents of the community of Winona Lake had a vision for making their town a shopping destination. They transformed a cluster of former workmen’s cottages into tidy shops, boutiques and restaurants. Today the Village at Winona is a must-stop for unique finds, from pottery to fine clothing to gourmet olive oil and so much more. Just a few miles down the road, the village of Pierceton is known as an antiquing haven. Shops filled with vintage treasures are found along the community’s main street. Nothing says fall like football. 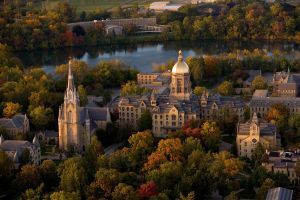 And nothing says football like Notre Dame’s Fighting Irish. The city of South Bend rocks on game weekends, with fun in store from start to finish. The game may be your highlight, but there is so much else to do while you’re in town. Each Friday before game days, a special Notre Dame Stadium Tunnel Tour leads you through the passageway that leads to the field. Fans love to stay up for the Midnight Drummer’s Circle when members of the Notre Dame Drumline play the Fight Song and more in front of the Golden Dome. On game day, head for the Joyce Fieldhouse for games, food, and giveaways, plus autographs from Notre Dame legends. After the game, enjoy South Bend’s lively restaurant and club scene. 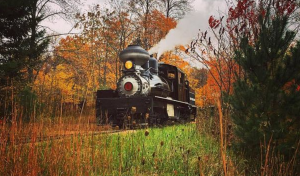 All aboard for some spooky fun when the Hesston Ghost Train rolls out the last three weekends of October at the Hesston Steam Museum in the small town of Hesston just outside of LaPorte. You’ll ride through the haunted woods aboard the Flying Dutchman Railroad. Watch out for the Mad Lumberjack in the Haunted Woods. But it’s all in fun and the ride is family-friendly, appropriate for small children. Just in case, this year will feature a ride on Oct. 26 with no scares whatsoever for the smallest riders. Start the day with breakfast at Doc’s before the trains begin their runs all afternoon. The museum features three different operating trains that give everyone a taste of what it was like to ride the rails in times past. Summer crowds may be gone, but the adventures go on at the Indiana Dunes National Park and Indiana Dunes State Park. In fact, cooler weather makes hiking and other outdoor activities even more enjoyable. 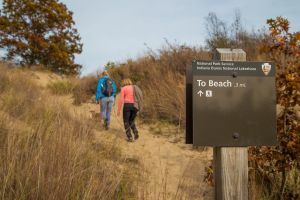 There’s so much to do that park officials and other partners plan to showcase numerous activities during the second annual Indiana Dunes Outdoor Adventure Festival, taking place Oct. 5-7. You might go hiking, paddling, biking, birding, or on photography explorations during the event. Even if you don’t register for the weekend, you can find an adventure anytime during the fall with maps and advice from state park guides. Birders in the know flock to the Indiana’s northwest corner, a haven for nearly 400 species drawn by Lake Michigan’s open waters and a diverse landscape of dunes, beaches, wetlands, and prairies. On hikes through various areas, they can spot numerous birds, some relatively rare. 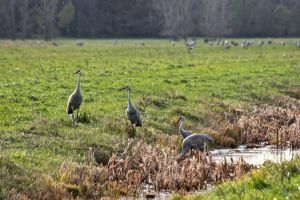 Fall is one of the best times to witness a fascinating occurrence as gigantic flocks of sandhill cranes migrate through the region on their way south for the winter. Each evening of the stop, roughly the last two weeks of October, they cover the fields, resting during their journey. It’s the largest congregation of sandhill cranes east of the Mississippi. Stop by the Indiana Dunes Visitor Center, and the excellent front desk staff can recommend the best places to see the cranes and view their fascinating jumping and dancing.